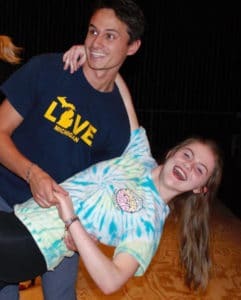 Ellie Botz of St. Joseph with her dancing partner, Aidan Cassidy as they rehearse for “All Shook Up!” an Elvis Presley musical that will be performed by CSB/SJU students in the Benedicta Arts Center at the College of St. Benedict. Shows are at 7:30 p.m. April 4-6 and April 11-13 and at 2 p.m. April 7. Botz is majoring in elementary education.